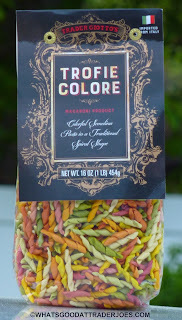 With five different colors represented, this imported Italian spiral pasta looks super exotic and exciting. Unfortunately, it doesn't taste that way. Like Russ's toddler being disappointed that the black bean rotini noodles weren't chocolate, I was similarly saddened that these weren't, like, the same five flavors as Life Savers. I mean, the red, orange, yellow, green, and ivory are pretty much exactly the same colors you get in both cases. That's tantamount to false advertising in my book. I was hoping to pair some sweet, fruity noodles with pineapple salsa or something. I'm actually just kidding about thinking they would be fruit-flavored, although I was hoping they'd have a flavor as flashy as their look. But alas, they're just normal noodles. If anything, they're even more bland than other plain pastas. If you're going to check these out, they're going to depend entirely on the sauce you choose to serve them with. Since they're actually a type of macaroni noodle, we decided to go with something cheesy and Italian: Trader Giotto's Three Cheese Pomodoro Pasta Sauce, which, much to my surprise, has already been reviewed on this blog. And as that four-year-old review suggests, the sauce is really darn good, and was a much bigger hit than the pasta itself, which will certainly fade out of memory quickly, despite its attractive packaging and colorful presentation. To be fair, though, there are a few other saving graces in regards to this product. The texture was nice. Cooking them according to the instructions yielded a nice soft batch of semi-tender, twisty, fine-grain pasta. It was filling enough, and for under two bucks, you can hardly complain about the value. I'll offer three stars here. Sonia will go with two and a half. 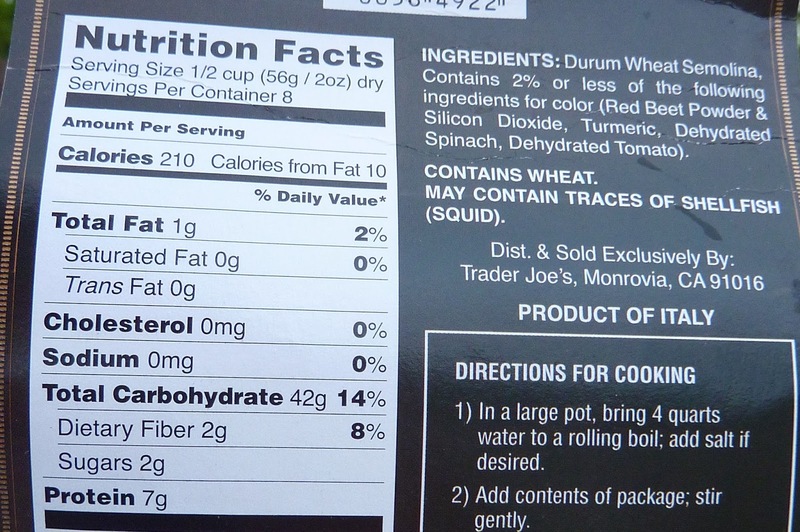 The most interesting thing about this product is that it may contain squid. Huh?? I was waiting to see a review in this before buying it since it's twice as expensive per pound as their normal pasta! Disappointed it doesn't seem worth it, especially since we enjoyed trofie so much last year in northern Italy... It was fresh pasta though, and served traditionally with lots of pesto. Even cooking it 5 minutes longer than suggested yielded an al dente pasta. Not very impressive. I was looking at these, and thought they were a pretty color. I tend to hoard pastas (it's an addiction). My thought is they'd make a pretty pasta salad. Thanks for the reviews. This pasta doesn't cook well. Al dente inside and squishy outside by the time you get "done" trying to get it to an edible state. It is also terribly bland as the writer suggests. I am taking it back and would suggest not buying it. Gotta agree with the other comments here. This pasta does not cook properly. If you follow the direction, you end up with pasta that's mushy on the outside and still raw (not quite the ideal al dente) in the middle. Would def not buy these again. I like this pasta. 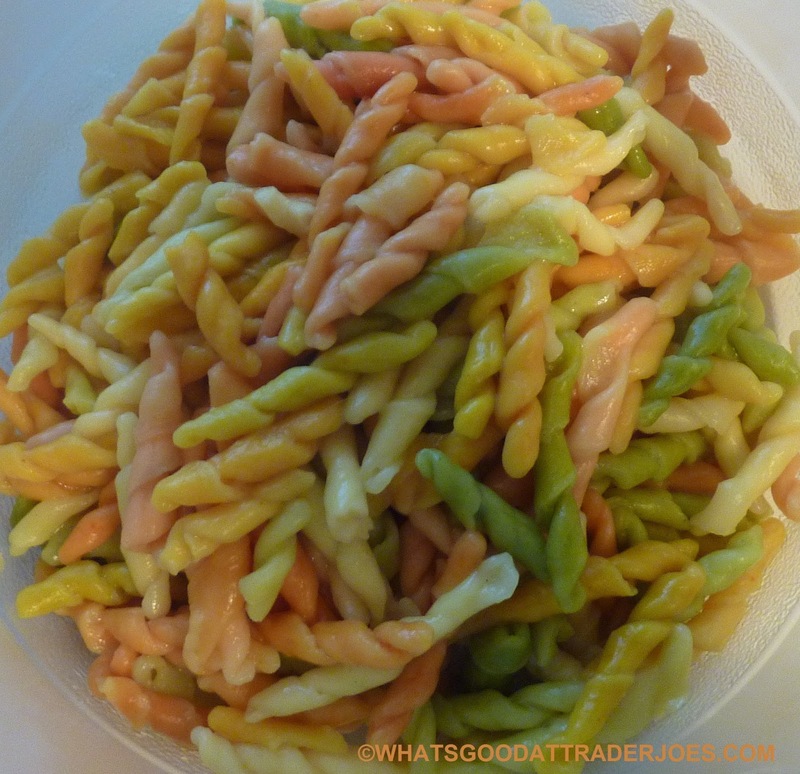 One of the main characteristics of Trofie pasta is that it is chewy. I made an American style meaty spaghetti sauce and put it together with some trofie. It was really good and the trofie added a chewy element to the pasta dish that was really enjoyable. I am so disappointed that I haven't been able to find this pasta on Trader Joe's shelves for several months! If I had known that, I would have stocked up on it. I find that since it is somewhat al dente at 12 minutes, I just cook it longer. I have an amazing, simple recipe for it and it even stands up to several days as a leftover. Just sprinkle a little at a time till you get it right. Then...be sure to top with parmesan cheese when you serve it. It's a spicy, flavorful side dish and the colored pasta looks great.